Main character wears glasses. Their friends tease them about the glasses, so they try not wearing their glasses. Usually funny hi-jinks (going into the wrong bathroom, misidentifying something, etc) ensue. (ex: Arthurs Eyes, Princess Peepers). Main character’s friend gets glasses and the main character is super jealous, even though their friend doesn’t really want glasses. Usually funny hi-jinks ensue as the main character tries to find ways to convince their parents and eye doctor that they really need glasses. (ex: Fancy Nancy: Spectacular Spectacles, I really absolutely must have glasses). Of course, there are some books out there that don’t fall into those categories. And falling in to one of those categories doesn’t necessarily mean that a book is bad – there are some fantastic books out there. But the fact remains that those scenarios aren’t really ones that our very youngest kids in glasses will encounter. And after you’ve read a few with the same story line, they can start to feel a bit contrived. I’m certain I’m missing some — please leave comments with other books that I missed! There are some things that set these books apart. The books tend to be more positive. The glasses or patches or contacts are a part of the kids’ lives, but the stories tend to show more of the kids doing normal things. And there are more of the little details about what life is like after the initial period of adjustment is over: In Samantha wears a contact, you see that sometimes mom has trouble removing her contact. In I can see just fine, there’s a glimpse of just how dirty our kids’ glasses get (all the time). In Jacob’s eye patch, we see just how often kids and parents are asked about eye patches. And now there self-publishing, which has allowed some of the books mentioned above to be published. When I talked with a children’s book publisher about a board book idea I had (stay tuned!! ), I was told that the audience for the book was just too small. Board books are expensive to print, but don’t sell for very much, so publishers want a guarantee that the books will sell a lot of copies. But now that more and more books can be printed on demand, it makes it more possible for parents to write books that reflect our experiences and get those books out to others in similar circumstances. Even if the group is small, the experience can be shared. And I think that’s a fantastic new change! Alison Joyce has a Kickstarter for her board book, “I see. You see. We ALL see!” Take a look and please consider supporting her! Cynthia Davis is working on a book, “My Bright Blue Glasses”, planned to be out in November, 2013, that follows the journey of a toddler “who had to deal with learning he has to wear glasses, patch and go to vision therapy.” She’s also working on another book targeted at older kids. I’m certain I’m missing some — please leave comments if you know of other book projects that should be included. 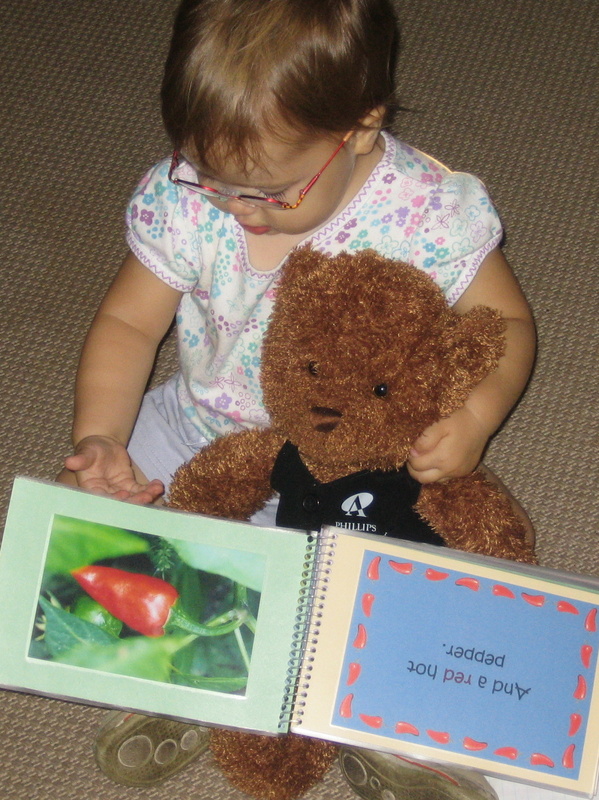 If you are working on a book that relates to young children with vision issues, please, please let me know. I would like to help you get the word out about the book you’re working on! 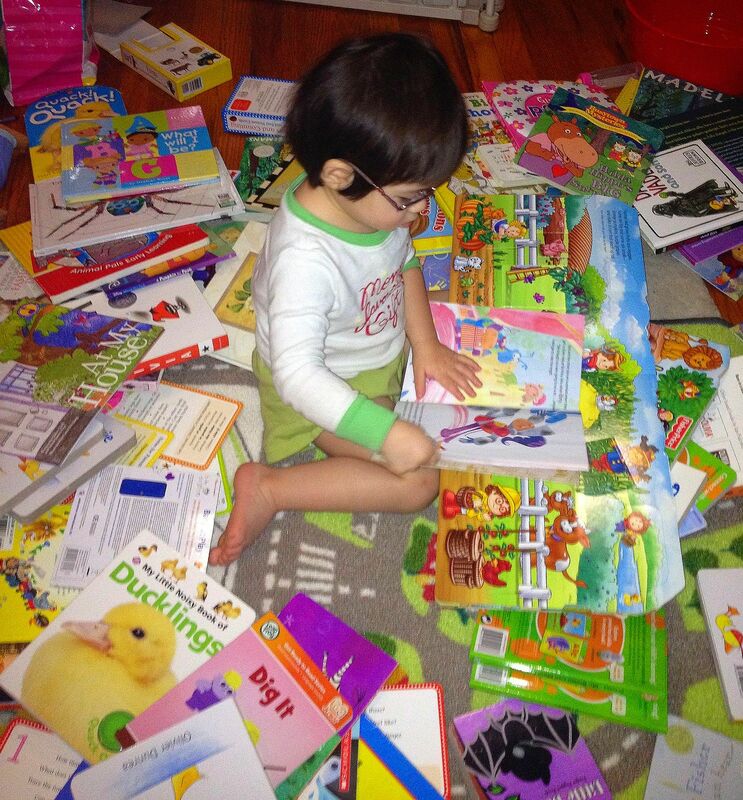 I will also continue reviewing and sharing traditionally published books – as far as I’m concerned, the more books out there for our kids in glasses, contacts, or eye patches, the better! Love reading this. Keep up the wonderful work you are doing. Our book, My Bright Blue Glasses, will be out in November. It is about a little boy who has to wear glasses, patch and attend vision therapy. Also writing another one for a little bit older kids. Thanks Cynthia! I updated the post with your information. Please let us know when the book is available. I bet there’s a lot to that. Zoe does not remember at all getting glasses. She does still love Arlo Needs Glasses, though (that’s such a great book). It’s a good reminder that not all kids respond to the same books or stories, and another good reason to have a lot of books for our kids to choose from! Love this post Ann, thank you for all you do!Our family likes to turn to books for every situation too 🙂 one we love is from a local – Maine- writer, so I am not sure how easy it is to get a hold of, but it is worth the search (Amazon has a few copies from 3rd party sellers). – “Hector” by Angela Nickerson is a sweet book about a little yellow warbler who needs to get glasses. We see little Hector at the eye doctor, nervous about glasses…but then he is in for a huge surprise when he can finally see! The book is beautifully illustrated and shows what things look like with and without his glasses. I just live how the author & illustrator are able to capture Hector’s wonder and appreciation footprint his new world! Thanks Amanda! I looked up Hector and it looks like a very sweet and charming book. Book sells for $6.00 dollars.